It has been a while since Ethel and Edna appeared and with Thanksgiving just around a corner or two, I wanted to check on them. This just might be the inspiration you need to check on some of your long-lost friends. Oh, there are excuses and more excuses, but talking about them does not get the job done. Believe me, I know. A few weeks ago, a friend I met in Ensenada Mexico called me from Fayetteville, Georgia. She and her husband were visiting his family and grand-kids. We talked and talked like it was just the other day. She has this great smile, wonderful, happy look on life, and switches between languages until I’m dizzy trying to keep up. We tried to get together, but that was period of dark skies, rain, and not great for sightseeing. I’ve also been in touch with an old, old friend from Florida. We became friends when we both worked at the same place and have always kept in touch. A birthday card, a holiday card, and a phone call or two. We are always talking about having that three-hour cup of coffee. And, one day we will. I keep close contact with my friend in West Virginia. We met when I moved up to Atlanta and she moved down to Atlanta. How we ended up at the same apartment complex is a mystery, and yet not really. 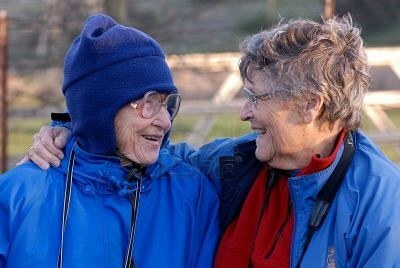 Somethings in life have a purpose and we have been there for each other over many years and many crisis moments. I’m certain all of you have these types of friends and many more. It’s just this time of year, we reflect on our memories and how blessed we are with our friends. Maybe it is a good time to let them all know. I have a great friend, Kevin, and life sometimes gets in the way of critiquing our writing at a lunch date. Lately, we have had some great laughs, and given the customers some greater laughs. We know some of the staff and they welcome us and our words. Of course, it is a Pizza Place close to the Police Department. So far, we have not been handcuffed with our readings and languages. What does everyone expect from writers of life in the big cities? No. There are no children around, but we are careful with the words we say and the words we whisper. SUN. I didn’t believe it still existed. We’ve had rain, rain, rain, wind, wind, wind, cold, cold,cold until I wanted to move South. Then one day, I thought the end had arrived. Dark, dreary days and all of a sudden, there was a blast of bright light in my living room. Thought I should run and hide, and then realized it was the sun. Do you know what disposition changes can happen with the brightness of the sun? Kinda like what will happen on Thanksgiving. Surprises of the traditional foods and extra surprises of not so ordinary tastings. I like to slip out and try something new, a twist to the traditional and who knows this may also become a tradition. 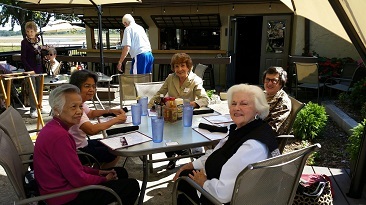 It is interesting to have new and old friends from other lands and compare our traditions. I’d love to hear from you about your Thanksgiving traditions and some unusual experiences you have had. Guess, I should wrap this up for now, but Edna and Ethel, thanks for joining us. Promise I won’t keep you locked up so long in the ‘Images’ part of my computer. Have a wonderful, safe Thanksgiving and enjoy food, friends, fun, at least for one day. Then it’s back to fun, friends, and fitness. I cannot believe October just disappeared leaving us with an extra hour of time. Wow! a catch-up from the spring. How are you going to use yours? From the look of the clouds out of my windows, dodging rain drops would be the best for today. From the television news, we had quite a storm last night with trees downed, normal for this area when we get a lot of rain. Some of our trees are old, huge, and fall like a game of dominoes. At least this happened after the “Trick N Treat” night. The pumpkins had their first go-around as Halloween; now they get to be used again. Yep, Turkey Day and pumpkin pies, pumpkin bread, soup, and great way to dress up leftovers. This means families gathering and sharing dinners in so many different locations. Traditions are a big part of the beginning of the Holiday Season and vary from one area to another. Oysters are a big part in certain locations, while here in the South, cornbread hits the table in form of dressing and bread. And, I have already heard the words “Black Friday.” Football will be a big part of the Thanksgiving Season and in some families, the meal is planned around the games. Still, this is a time for rituals, togetherness, family first, and special memories. This brings me to a short blog, but long on pictures. 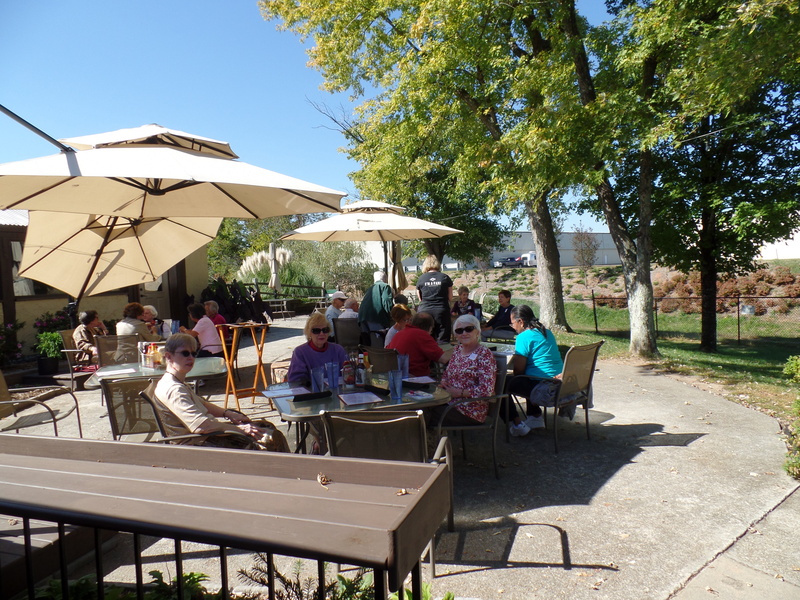 Our SilverSneakers Group had our Fall Festival on Wednesday, October 21, 2015. We had to wait later this year for the rains to subside and lucked out. 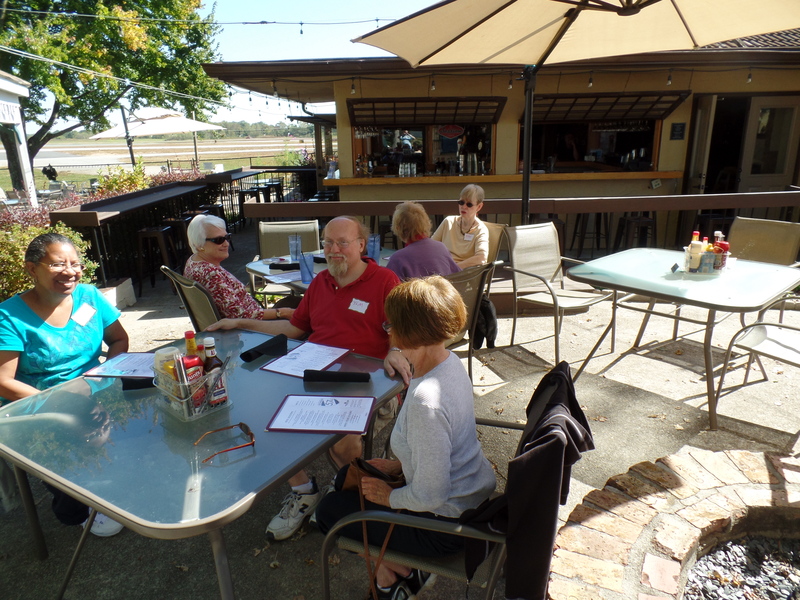 The patio at the 57th Fighters Restaurant was sunny, without being hot, a soft breeze, plenty of planes coming in and taking off, and the conversations animated and full of laughter between bites. Proof? Look at the following pictures.